Dutch company Mars One, which aims to send people to the Red Planet within a decade, on Tuesday unveiled its first concept for a space suit to protect humans "under the most difficult conditions." The pressurised suit will include an impact resistant helmet with a see-through bubble. It will "make maximum use of local Mars resources to provide a safe and comfortable environment for crew members," Mars One said in a statement. Made from material similar to that used for NASA's astronauts when exploring the Moon, the suit's design also takes into account "new challenges" presented by Mars' surface. This included dealing with omnipresent red dust, which the company admitted still "needed more work." Consisting of interchangable parts, the suit will have to ward off life-threatening radiation and be able to fit many different seizes of would-be Martian explorers. The space colonisers will have 3D printers with them to print replaceable parts such as nuts and bolts and even fabric used in the construction and maintenance of the space suit, Mars One said. Initially drawing some 200,000 hopefuls from 140 countries, the ambitious Mars One project plans to send 24 explorers to the fourth rock from the sun within 10 years, partly funded by a television reality show about the endeavour. 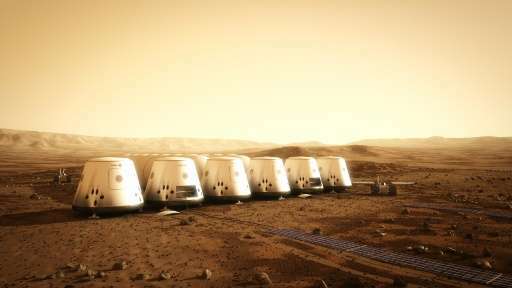 Similar to plans by SpaceX chief Elon Musk, the Mars One team aims to send an unmanned spaceship to Mars by 2018. One-way trips to the red planet is scheduled to start in 2026. The new explorers will have to live in small habitats, find water, produce their own oxygen and grow their own food. So far, only robotic missions by NASA have successfully reached Mars and the agency does not plan manned mission until the 2030s.